R.F. Hunter, Purma Special 127 roll film camera. Photograph gallery. Normally, a 127 sized camera would take negatives roughly 38mm square - the Purma Special produces a negative 30mm square to get 16 frames out of one roll. There is a small quality price to pay for this reduction in area, but given the limitation of the lens it hardly matters. In use the camera is easy to use with the shutter speed being selected by orientating the camera as previously described, The lens is limited and the subject needs to be at least 3 to 4 metres away to be sharp. Taken in failing light with the shutter set to it's slowest setting. It was actually very windy, which is why the trees are blurred in the background. 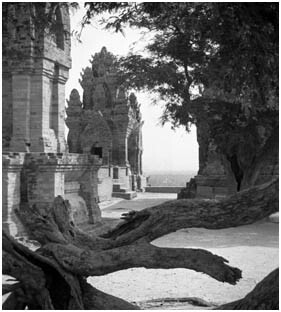 Getting a result with the Purma Special is largely achieved in the darkroom, a good selection of various papers or multigrade filters are required to use the rather variable negatives. 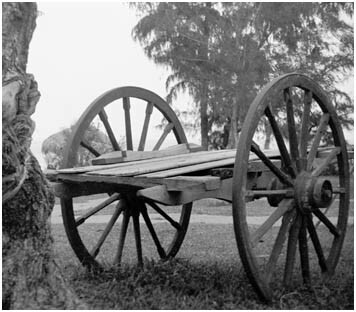 This cart would originally have been pulled by oxen or water buffalo, and was found at Phan Thiet on the East coast of Vietnam in late December 2003. 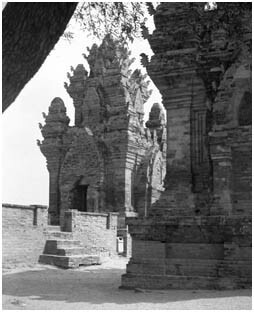 Left, three towers were built to commemorate King Poklongarai at the end of 13th century. He was remembered for his good works for the Cham people (the predecessors of the modern Vietnamese) in particular the irrigation systems he had built. The highest tower at this site is just under 14M high. 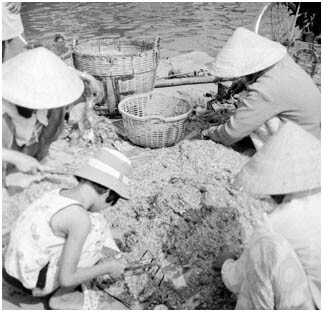 Demonstrating the inability of the lens to focus below 3M is this shot of Vietnamese women sorting fish from prawns and such. The women and the young girl all adopt this crouching position and I can only marvel at what must be in their diet that allows them to do this late into life - when I seize up completely after a few minutes. This colourful scene was the location for one of my daftest photographic disasters, I thoroughly documented this scene and others with one of the trusty Pentaxes, only to discover that I'd got confused at some point and unloaded the film. Pillock.